This site was developed as a way of sharing information about Barnum family lines of descent, from our early English forebears down to the present, and to provide a place for living members of the family to add their own information. 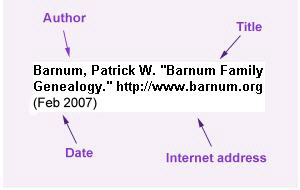 It is intended as a reference site for anyone who is researching the genealogy of the Barnum, Barnam and Barnham families worldwide and is available 24 hours a day from anywhere in the world. Thanks are due to many family members and relations who have unselfishly shared their own information and research for the benefit of other researchers. Here you'll find farmers and businessmen, soldiers and sailors, masters of the manor and indentured servants, Medal of Honor recipients and deserters, murderers and suicides, and thousands of people just like you and me. Some of them lived their entire lives without straying five miles from home, while others traveled the world over and lived lives filled with adventure. They all had one thing in common, though, they were our ancestors and our cousins! The vast majority of the Barnum families of North America are descended from Thomas BARNUM (1625-1695), the immigrant ancestor, and their lines of descent are well represented here. Some of the English members of the Barnham family, from which Thomas is believed to have descended, are also present and there should be clues on this site to help in tracing the majority of Barnum lines of descent. If you'd like to view a brief introduction containing information about the immigrant ancestor Thomas BARNUM and our famous (some say infamous) relation Phineas Taylor "P.T." BARNUM, please click here. Copyright 1998-2016. The format of this website and all original images, statements and narrative included on it are copyrighted and all rights are reserved. Factual information, such as dates and places, may be freely quoted for use in private genealogical research when accompanied by a full source citation, including the date of acquisition. Click here to view the format of a citation for an Internet resource. The publication of large extracts from this site in any form requires prior written consent.